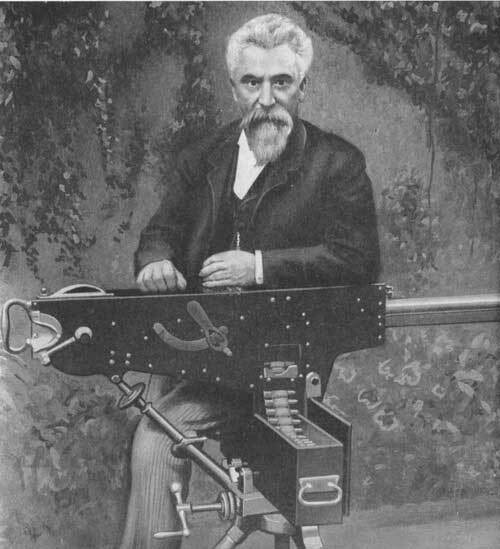 In 1881, Hiram Maxim invented a machine gun that made every other machine gun in the world obsolete. His gun cycled the action using the recoil produced by the explosive gases from the fired bullet. It was an idea whose time had come, as other inventors quickly applied the principle to other arms. Hiram Maxim was an American inventor and innovator born in Maine in 1840. He had many inventions to his credit over his life, but the most famous (or infamous) was the machine gun. 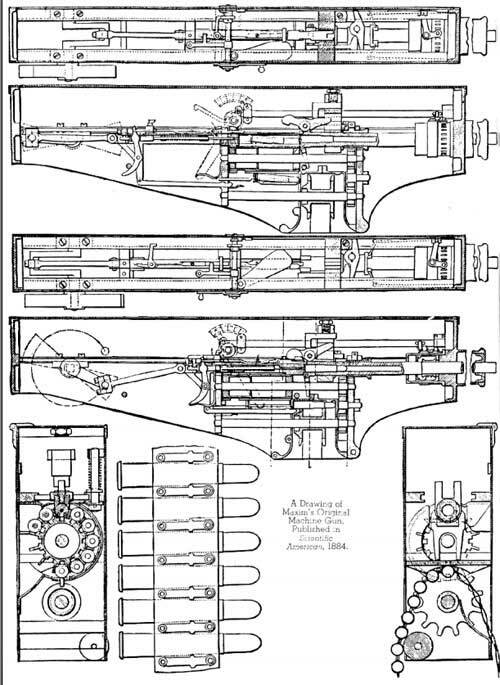 After he had moved to London in 1881, he began to apply himself to designing a machine gun. There were many machine guns in action at the time, but all were human powered. He set up a workshop at 57 Hattan Gardens, got some lathes and milling machines and went to work. He made the tooling and hardened parts himself, to the surprise of his apprentices. He made everything except the barrel for the prototype, which were off the shelf units for henry rifles. The gun was chambered for the .45 British service round. His mechanism self loaded the next round, first fed from a ramp, then a drum and finally a belt, so that a continuous rate of fire could be accomplished by simply holding down the trigger. The barrel was mounted in bearings and would move rearward three quarters of an inch, which was enough to unlock the bolt and cycle the action. The barrel was also water cooled to keep it from melting. Theoretically it could fire 600 rounds a minute, but practically it was somewhat less than that, although it was adjustable. 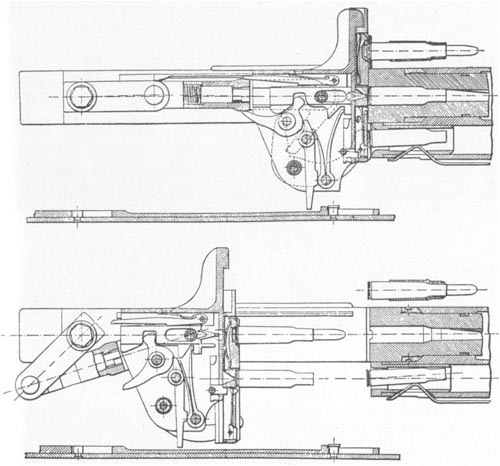 Maxim had patented gas operation and blowback operation besides recoil for arms. He moved to a factory in Crayford, in greator London, and soon merged with the Nordenfelt firm, to become the Maxim Nordenfelt Gun and Ammunition Factory. This was absorbed by the Vickers Company in 1897, who had been an investor in Maxim's company since the beginning. 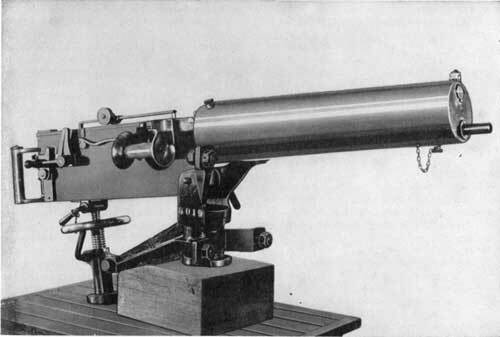 The British Army tested the gun in 1887 and put in it's first orders, as did the British mercantile powers such as the British South Africa Company. 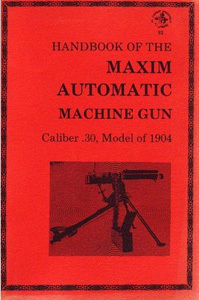 Maxim soon had orders for his new gun from all over the world. 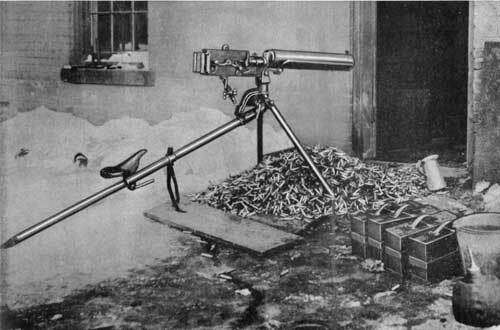 By World War 1, everybody except the United States had the Maxim gun. The first British use of the new gun was the Matabele War of 1893. 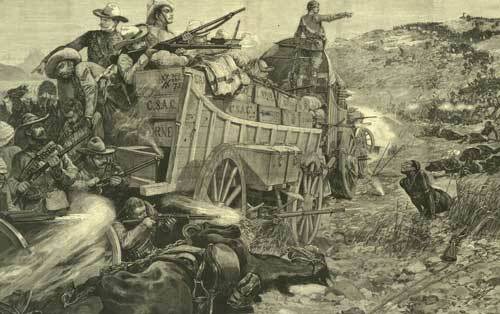 Irregular troops, police and volunteers faced off against the Matabele, and fought from wagon laagers, usually with Maxim guns on the corners. It didn't take much to goad the Matabele to charge, and human wave attacks were quickly and decisively put down with torrents of bullets. If it weren't for the Maxims, the war would have taken a decidedly different turn. The colonial wars of the British from here on out used Maxims to good effect. On the northwest frontier in India, the British were saved again and again by the steady drum of the Maxim gun. In the reconquest of the Sudan, the Dervishes finally succumbed to the gun. It was only because of the machine gun that small numbers of Brits could weigh so heavily against massed native populations. The Maxim guns were used by both sides in the Boer War. Not suprisingly they were better suited for defense. But it wouldn't be till WW1 that the British would use these guns against a modern army such as it's own, and they would come to know the grief of facing the Maxim gun.